You’ve got to admit that when you think of Amsterdam the last thing that springs to mind is its exotic wildlife. Well the next time you’re sitting in the Vondelpark or at a cafe nearby Oosterpark and a flock of brightly coloured birds swoop by, rest assured you’re not tripping. What will at first appear to resemble a parrot, is in fact a parakeet. It’s an easy mistake to make as their bright green feathers and ability to mimic human speech make them almost indistinguishable. 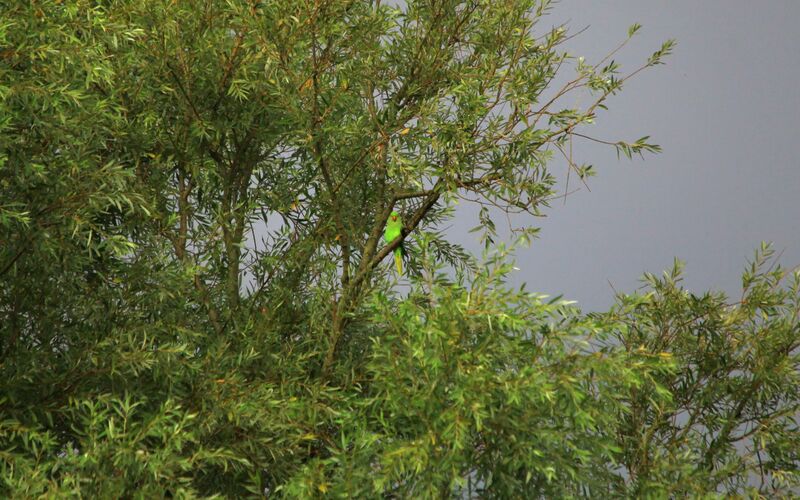 There are just under 4,000 parakeets flying around Amsterdam alone. Many locals speculate that the tropical birds must have escaped Amsterdam’s Artis zoo years back. What else can explain this phenomenon? While the zoo’s close proximity to Oosterpark make this a plausible theory, it’s thought that they are likely descendants of pet parakeets that were released into the ‘wild’ back in 1976. This was when they were first spotted out and about the city. Native to India and Sub-Saharan Africa, these highly adaptive species must have found a way to survive their first winter in the cold city, making it easy for them to call Amsterdam home. It’s after all not a bad place to settle, and many expats from all corners of the world will attest to this. Though the cold is the one single thing that has sent many expats packing. Whether human or bird, if you can brave a winter in Amsterdam, then your search for a new home is more or less over. So far it seems that the parakeets have adapted to life in Amsterdam pretty well. They are being born in the wild, using local parks like the Vondel as their breeding ground. Finding food is not a hard feat with the millions of tourists and locals leaving a trail of leftover patat (french fries) and falafel around town. What is an Amsterdammer’s trash, is a parakeet’s food heaven. Although they are an absolute delight when spotted around town, ecologists are more than a little worried about the impact these exotic species are having on birds native to the Netherlands. 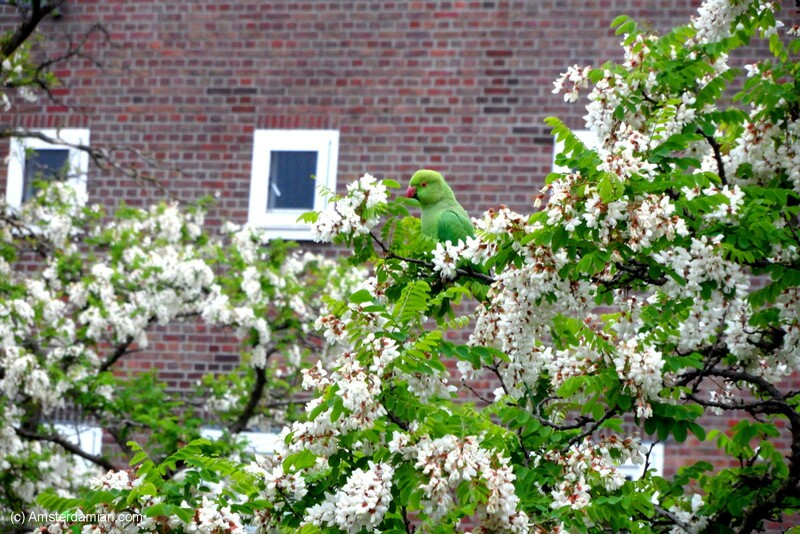 Research indicates that fewer local birds are nesting in areas the parakeets have apparently taken over. They have even gone as far as to claim the resting holes of native woodpeckers as their own. 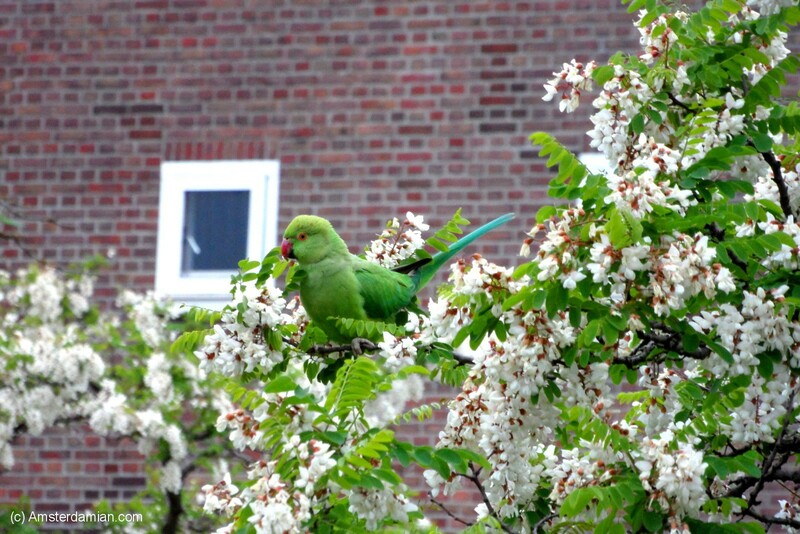 Perhaps the worry of ecologists is justifiable as the number of parakeets in the city has doubled in the last four years alone. Doubled! It seems they’ve been at it like rabbits and are on the verge of pushing local birds out of their natural habitat. As stunning as they are, are parakeets doing the Netherlands more harm than good? While ecologists are fretting about the future of birds in Amsterdam, perhaps we should all take a moment to thank our lucky stars that it was only a few parakeets set free in 1976. If they were an army of tarantulas and poisonous snakes however, then we would have an even bigger problem on our hands. Ultimately, Amsterdam wouldn’t be the relaxed city it is today, as neither human, mammal or bird would be safe. So far it seems that the parakeets have adapted to life in Amsterdam pretty well. They are being born in the wild, using local parks like the Vondel as their breeding ground. Finding food is not a hard feat with the millions of tourists and locals leaving a trail of left over patat (french fries) and falafel around town. What is an Amsterdammer’s trash, is a parakeet’s food heaven. Although they are an absolute delight when spotted around town, ecologists are more than a little worried about the impact these exotic species are having on birds native to the Netherlands. Research indicates that fewer local birds are nesting in areas the parakeets have apparently taken over. They have even gone as far as to claim the resting holes of native woodpeckers as their own.